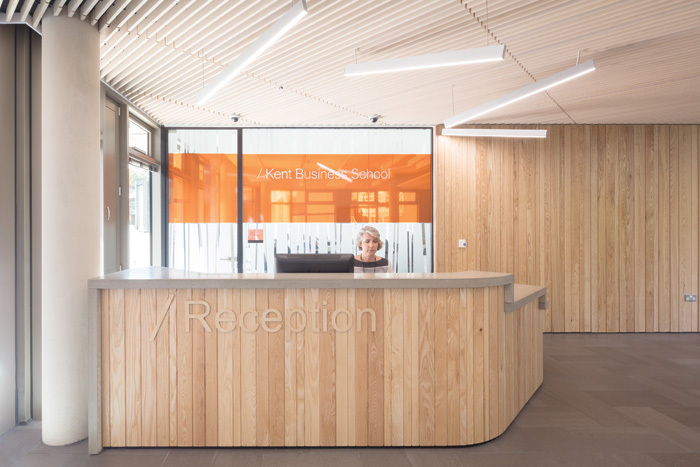 Penoyre & Prasad has delivered a new building for the University of Kent, set within beautiful woodland on the northern edge of the campus. 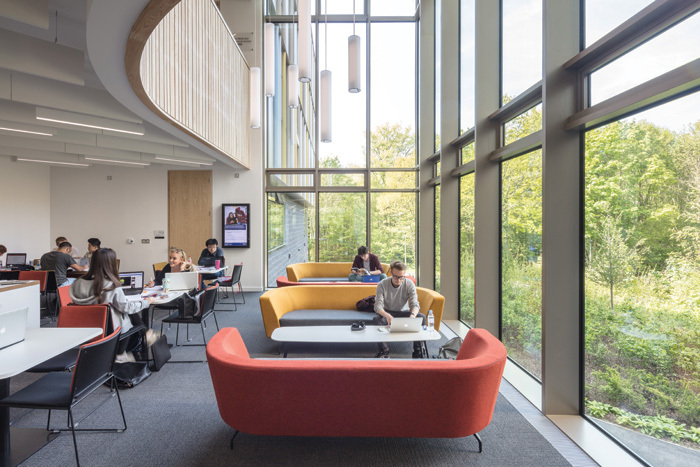 It brings together two schools: Kent Business School and the School of Mathematics, as well as statistics and actuarial science, into a single 8,000 sq m building comprising interactive social learning areas, a cafe, innovative teaching environments, academic workspace and open-plan research space. It’s the largest academic building for the university since it was founded in the Sixties. The new building is carefully sited among the mature trees and coppiced woods so its overall size is never fully visible nor dominating the surrounding woodland. Its users have extensive views across the forest canopy. 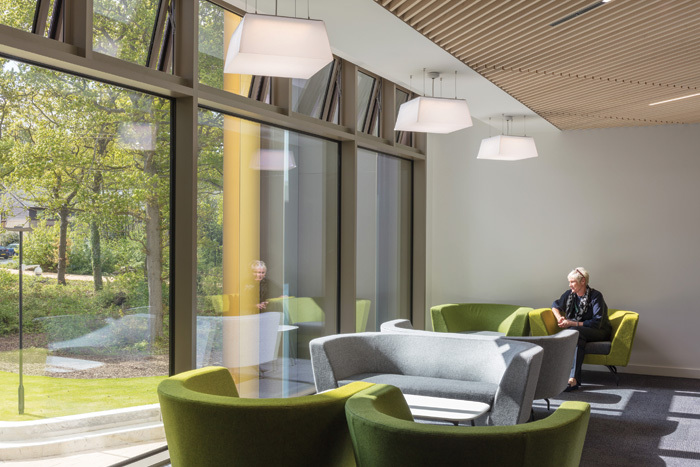 The colours and patterns of the woodland are echoed and reflected in the material palette, furniture and graphics used in the building. Its facade features coloured aluminium fins that reflect the changing light and movement of the trees. The woodland setting became the design inspiration for the project, with further inspiration coming from Johannes Duiker’s 1935 Hotel Gooiland and works by Alvar Aalto, including his Baker House student housing for MIT. The Business School and the School of Mathematics are placed at either end of the flexible W-shaped plan, allowing for flexible growth and development, as well as interaction between the departments. 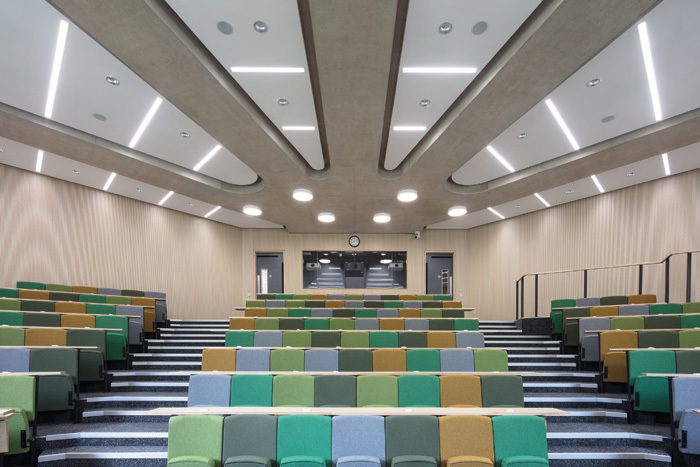 The plan’s open corners are for research and knowledge exchange, and are supported at each level by a tapering concrete ‘hand’ that also provides longer spans for the lecture theatres below. 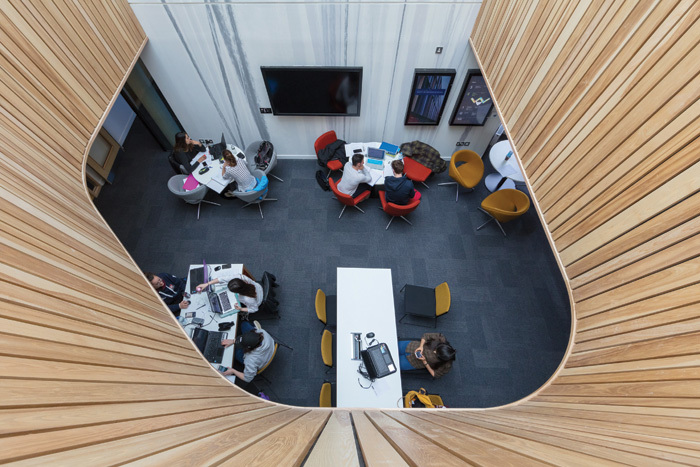 Lecture theatres, seminar spaces, a Bloomberg suite, cafe and social learning spaces are located on both ground and first floors, and around a dramatic top-lit concourse. Penoyre & Prasad consulted extensively with students, academics, admin staff and catering teams. Natural ventilation, roof mounted PVs, long structural spans and raised access floors all contributed to the building’s BREEAM Excellent rating. It was a key feature of the brief, says Goodfellow, with the client detailing ambitious environmental targets for the building, as well as the aim for a largely naturally ventilated building, to the practice. 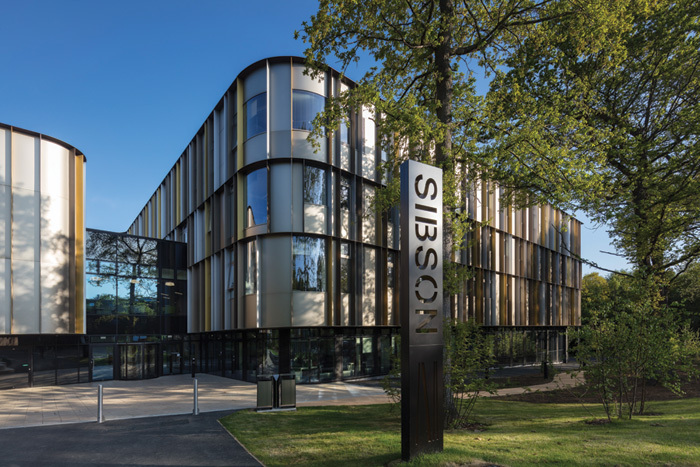 ‘Celebrating its unique natural setting, the Sibson Building creates a vibrant new destination within beautiful woodland for the university on its the parkland campus,’ concludes Goodfellow.